The TRIGET-Family consists of highly integrated, flexible, and robust PC/104-Plus compliant Ethernet modules for industrial use. 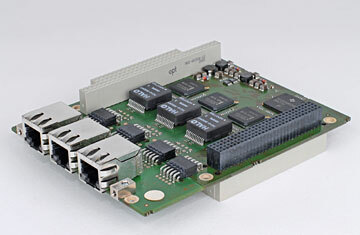 With a single PC/104-Plus module a system can be expanded with up to three Gigabit Ethernet controllers! Through the use of a PCI to PCI bridge the TRIGET requires only one slot on a PC/104-plus stack. Therefore the stack still can be expanded by up to 3 other PC/104-Plus cards. To match the different system requirements, different interfaces and mechanical versions are offered. Chose between RJ45 or 2mm lockable headers as well as two mechanical sizes. The TRIGET works on 5V and 3.3V PCI host boards. Further it supports up to 66MHz PCI operation. These features make the TRIGET ideally suited for network applications that require many independent high-speed interfaces. Through the robust and flexible design the products can be well used in any embedded system. Compatible with the existing Intel 82541 PI driver software! 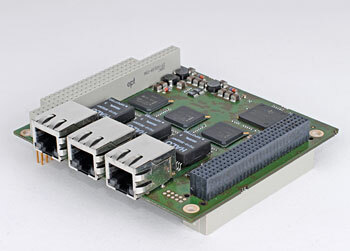 TRIGET-3S 3 Gigabit Ethernet controller on standard PC/104-Plus module, interfaces RJ45 connectors. 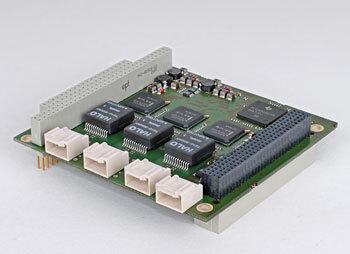 TRIGET-2S 2 Gigabit Ethernet controller on standard PC/104-Plus module, interfaces RJ45 connectors. 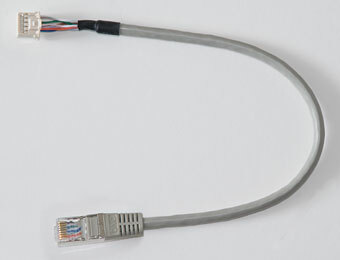 TRIGET-1S 1 Gigabit Ethernet controller on standard PC/104-Plus module, interface RJ45 connector. 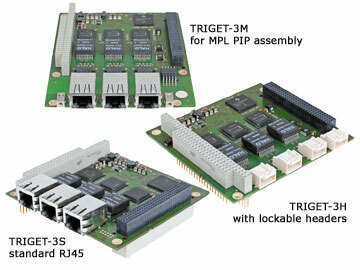 TRIGET-3H 3 Gigabit Ethernet controller on standard PC/104-Plus module, interfaces 2mm lockable headers. 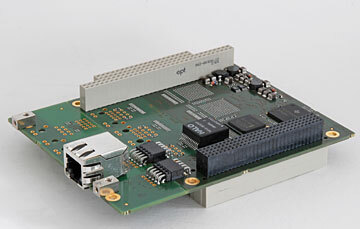 TRIGET-2H 2 Gigabit Ethernet controller on standard PC/104-Plus module, interfaces 2mm lockable headers. 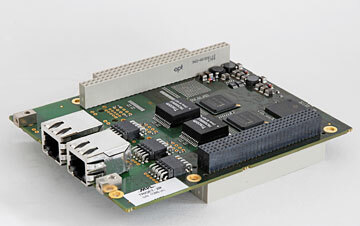 TRIGET-1H 1 Gigabit Ethernet controller on standard PC/104-Plus module, interface 2mm lockable header. TRIGET-3HKIT Cable and connector kit for TRIGET-3H. 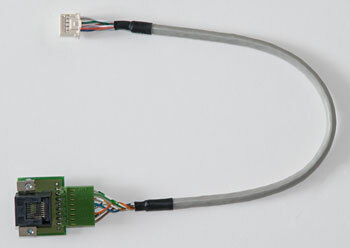 Small PCB with 3 Ethernet interfaces over RJ45 connectors (cable length 300mm). TRIGET-1HKIT1 Cable and RJ45 adapter PCB for TRIGET-xH (cable length 300mm) - no status LEDs. TRIGET-1HKIT2 Ethernet cable 300mm long, 10 pin 2mm lockable socket to RJ45 connector. TRIGET-Cx Custom specific version with 1-3 Gigabit Ethernet controller and required Ethernet interfaces. For deployment in harsh environments, the TRIGET can be ordered in an extended temperature version. Every system needs to pass various tests in a climate chamber to prove that it will perform flawless over the temperature range indicated.